The Legion National Youth Track and Field Championships represent the pinnacle of athletics in Canada. Each year young men and women come together in the name of sportsmanship, promoting their country, their teams and their events. For the 2013 games--held at McLeod Park in Langley--these teens will vie for recognition in countless categories, such as: relays, pole vaulting, long jumps and more. One Big Broadcast is proud to be part of this process... by creating the official Young Olympians website (http://yo.ca). 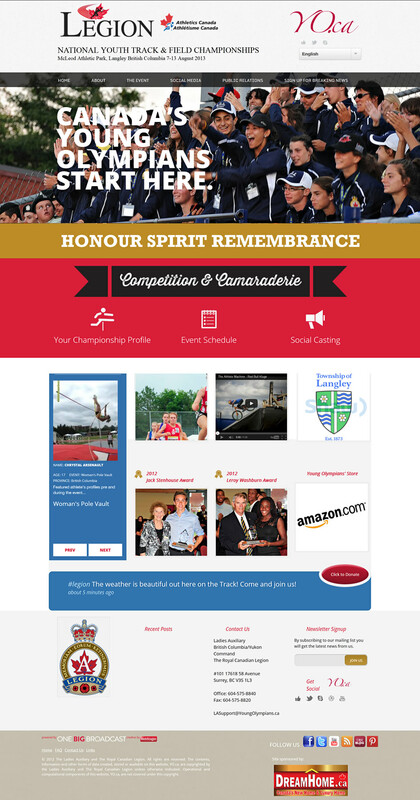 Member Profiles: each participant in the Legion Championships receives a customizable member profile. These profiles promote individual players’ events, schedules, victories and more. They are also linked to social networks and news outlets to draw in key demographics. Image Galleries: images inspire traffic. Our console allows them to be quickly added to the site, as well as to profiles. These private galleries promote the Legion Championships, fusing with Google and other top search engines to garner high rankings. Social Networking: the Young Olympians web site is linked to viable social communities, such as: Facebook, Twitter, Pinterest and YouTube. This allows for greater communication and effortless networking. Widget Platforming: simplicity is key for a successful social strategy. Our use of widget platforms allow members of the Young Olympians team to experience one-click posting. All information is easy to maintain and seamless in its results. The unique One Big Broadcast platform provides every athlete, parent, alumni member and sponsor with individualized profiles and tools. This allows them to utilize social media--like blogs, IMGY galleries and more--not only on the Young Olympians page but also within the Internet itself. They can now link their site information with their other social accounts (Facebook, Twitter and the rest). This connects Legion news to the rest of the online world, dramatically increasing visibility. With the One Big Broadcast console each user participates in the social campaign. Instead of occasional administrative posts, YO.ca is referenced again and again by the ones most affected by it. Links are created; interest is piqued; and the site flourishes. Think about how harnessing common collaborators could affect your sporting event, brand or business!